Some would call we won. Including definitely 4 of us. But end of the day it comes to 4 or 5 people who we need to convince. Judges are known as CEOs, CIOs, CFOs but looking at the current status of country it is a truth fact that if they were much capable of handling the situations, making the right decisions, the country would not be in this state. That is why I do not give much about Sri Lankan business minds say unless he/ she is an entrepreneur. In a summary, does not matter whether you call I am illiterate or wrong for me its us who were the best. I think I am reasonable enough given that the so called business master minds would have never thought to this extend when they were students. As I mentioned earlier, unfortunately its 4 or 5 people who decides our journey. Cannot do much. That is the rule of this game. The solution we proposed was about a Social Network that connect people who have achieved personal goals with the ones who would like to achieve similar goals. We designed a really cool Windows 8 app with lots of credits gone to Charith in making the colors and alignments right. But end of the day I realized most of the Sri Lankan business minds will go with an electronic equipment that could light a bulb at least rather an app with a future. The team was a fantastic four, no doubts which prove having people unknown gives much results rather working with people well known much. Charith who was the designer could do too much of what I could expect from a 2nd year undergraduate with the design and also Namila with the development. When I was in 2nd year, I was wandering around without a proper decision to be made on whether choose Java or .NET. But today, people have right mind set with a proper vision on what they are going to be in future. Could not forget speak about Himeshi who can turn search in to a research in a shot while and come up with something cool that could be presented. Being a spectator for four years in my life, I would rate her highest as the best presenter being on an Imagine Cup stage in Sri Lanka. 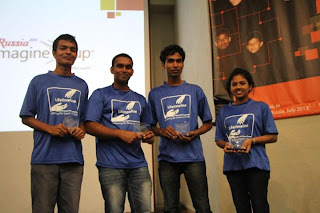 Also Akila aiya as the mentor and with all sorts of experience being the captain of the Sri Lankan team which achieved best in an Imagine Cup, we had quite good hopes. The value he added to the solutions by showing the gaps of our planning was amazing. Finally about me, I just had to look the way things go and see what would suite at which point including designing the technical architecture. I knew we could easily get through first round and semis as well. That was so easy to decide since the competition is categorized in to 3 categories since this years as Games, Innovation and World Citizenship. Finally becoming the Winner of the World Citizenship category is a great achievement. "But end of the day I realized most of the Sri Lankan business minds will go with an electronic equipment that could light a bulb at least rather an app with a future."